The city has been sweeping up homeless encampments and confiscating belongings. 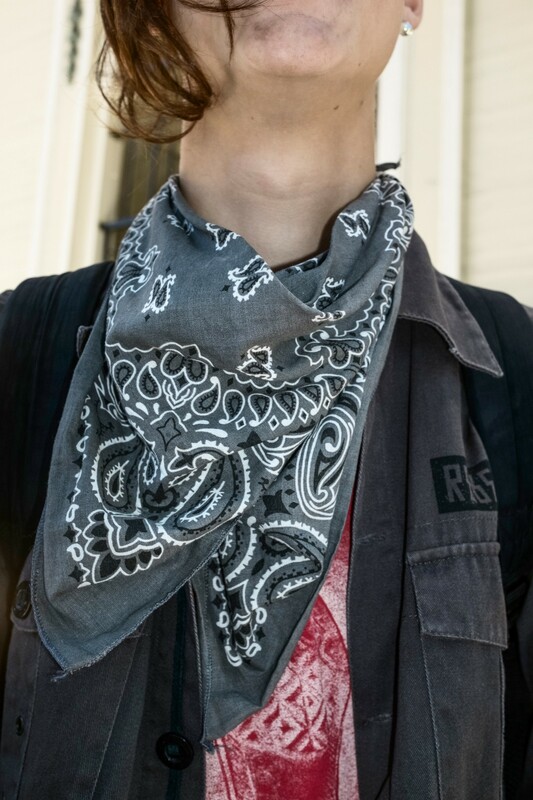 We asked youth what they carry with them. 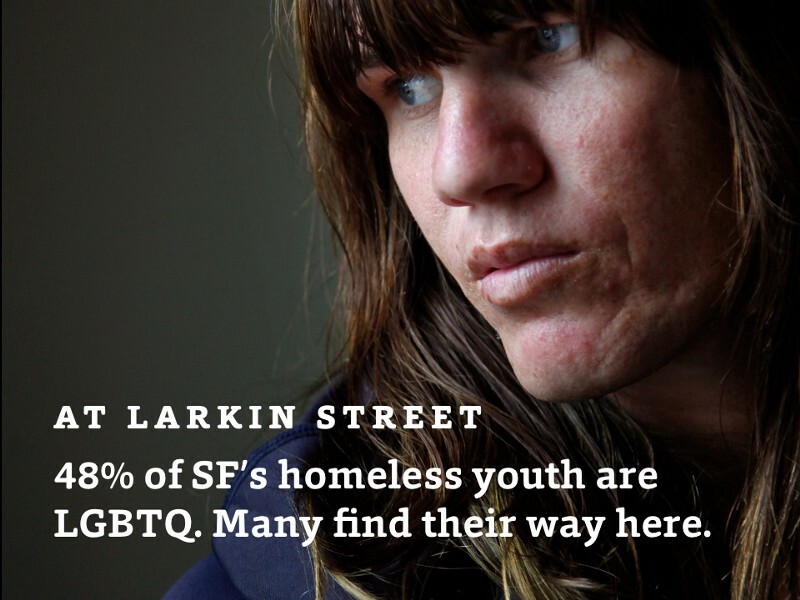 This is a part of our photography series on youth homelessness for the SF Homeless Project. 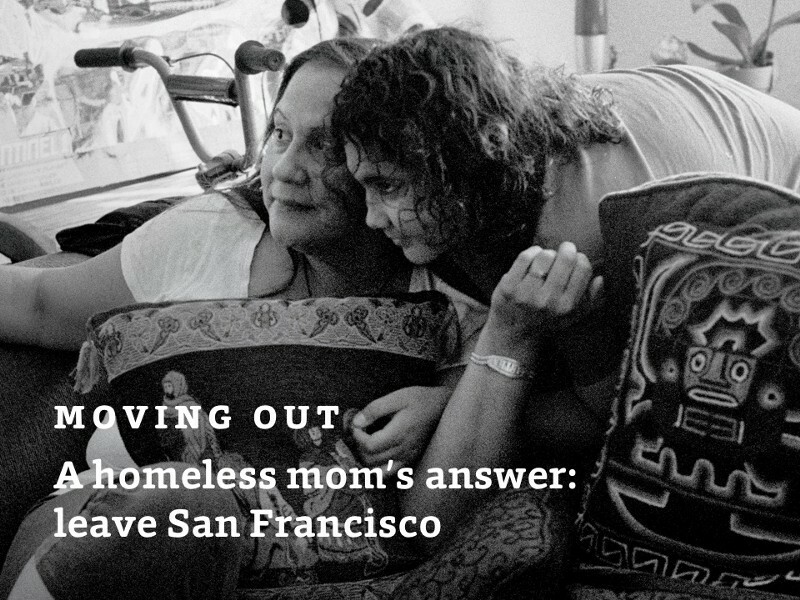 Learn about parenting in a shelter, being homeless and LGBTQ, and life on the road. Americans constantly discard the detritus of their country’s wealth, and in a boomtown like today’s San Francisco, it’s easy come, easy go. Trash bins yield old laptops and cellphones to be used or sold to fencers. 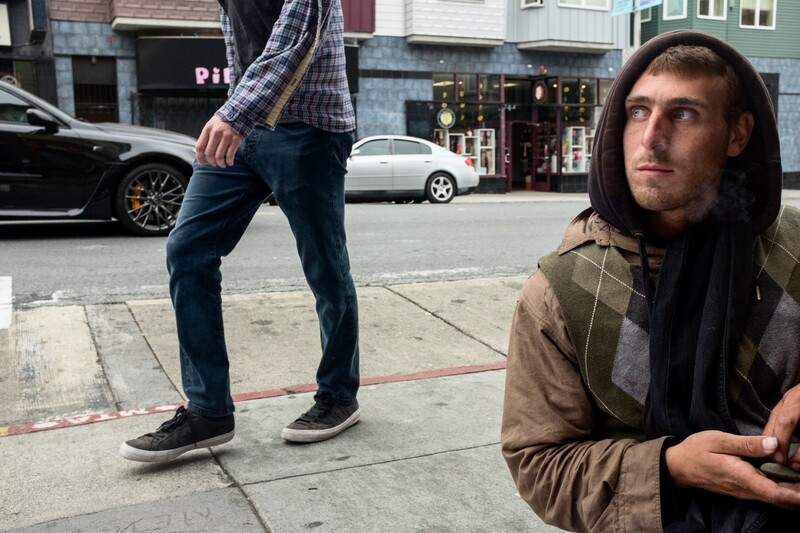 Panhandling can net $40 on a good day on Market Street. Urban hunter-gatherers rifle through the “as is” cartons of clothes at Goodwill, $2 a pound. The Social Security office will hook you up with an Obama Phone — a government-subsidized acknowledgment that a phone is almost essential for survival. But alongside this abundance is a city-imposed scarcity created by policies that seize belongings from homeless while doing little to solve the problem of having nowhere to keep them. Mayor Ed Lee mandated high-profile sweeps of encampments on Division Street (after homeless were forced to go there during the Super Bowl) and in the Mission (after a homeless man was shot dead there by the police). 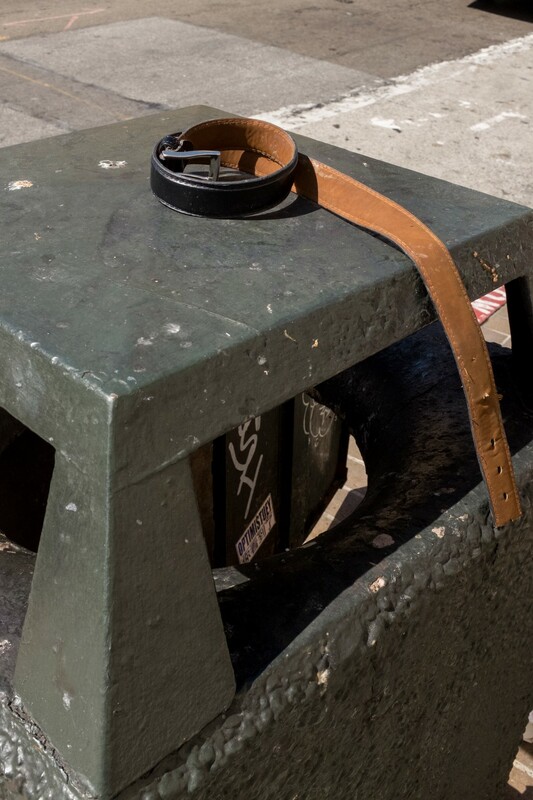 A recent study by University of California researchers and the Coalition on Homelessness surveyed 351 homeless people in the city, finding that 46 percent had had things confiscated, and 38 percent had had their belongings destroyed by the city. 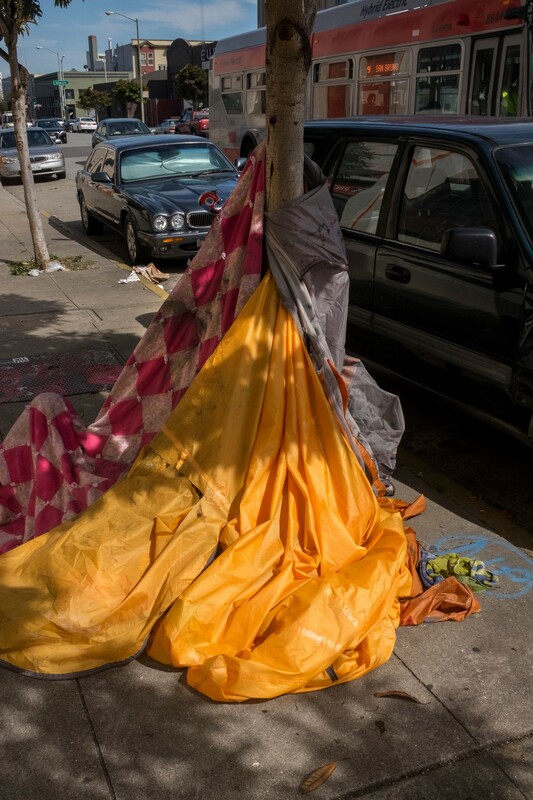 Homeless people have pressed successful suits in small-claims courts for years, and, after recent sweeps, the ACLU and others issued Lee a demand letter to stop what they called illegal confiscation of personal property. If the mayor doesn’t respond with a new policy, the groups say they’ll sue. In June, seemingly in response, moderate San Francisco supervisor Mark Farrell introduced a ballot measure for the November election proposing that the city create a policy banning encampments so long as the city gives 24 hours’ notice and offers an alternative-housing option. Progressive supervisors are countering that the shelters are maxed out and that there’s nowhere to send the campers. 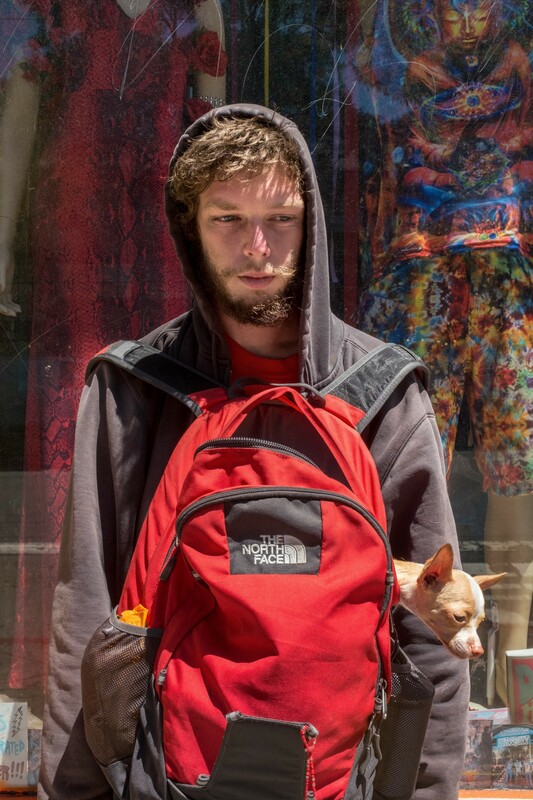 At the top of the list of many young homeless people’s most prized possessions are their dogs: dogs better cared for than their owners, puppies stored in backpacks worn over stomachs BabyBjörn-style. They are companions, and especially for the young itinerant types, sometimes their only one. “It’s nice to have someone to snuggle with,” one 20-something former camper tells me about his puppy, Steely. 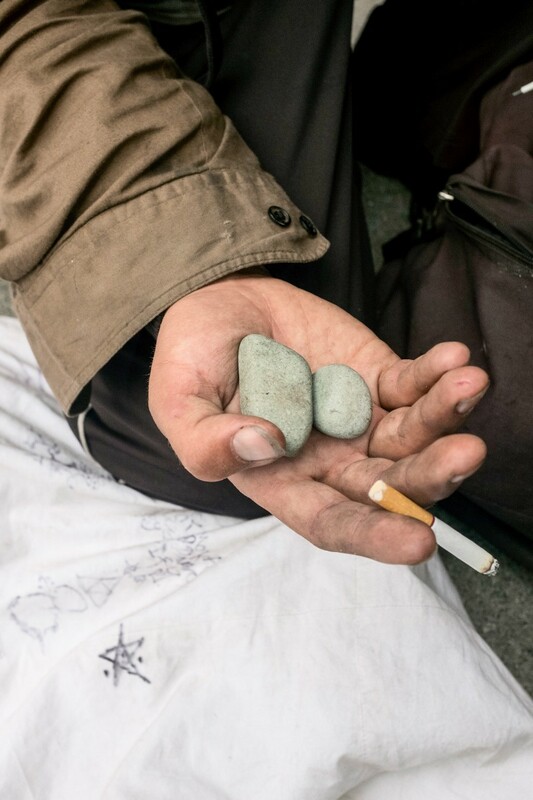 “It’s safer, and no matter how bad your day was, he still wants love.” There’s an economic perk, too — when panhandling, you can net three times as much. The things young people carry are a mix of necessity and comfort. NEIL, THE COPS CAME AND TOOK EVERYONE’S STUFF. SORRY. Michael, 24, carries headphones, highlighters, condoms, soap, a ribbon, some broken glasses that serve as a mirror, and half an Italian sandwich. 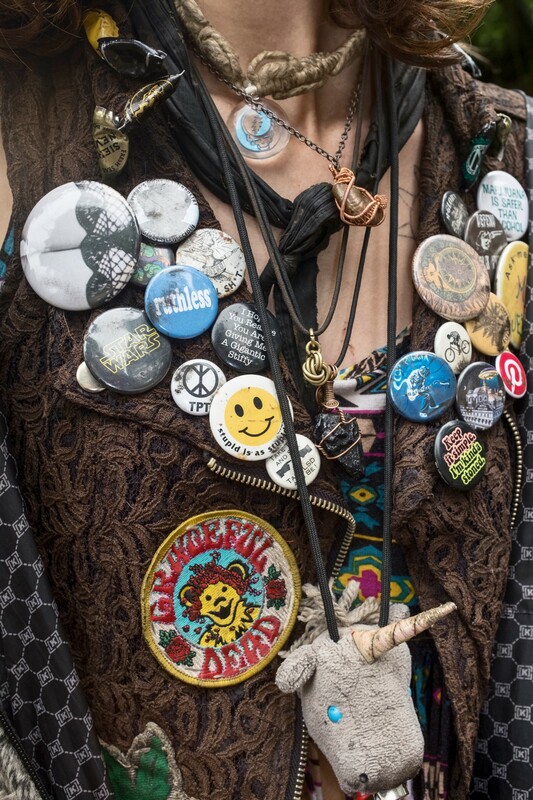 He keeps a pair of stones in his jacket pocket. Harley met his wife, Gabrielle, hitchhiking. They list a marriage license, clothes, food, journals, dog stuff, and weed equipment among their belongings. Useful items are often found on or near trash bins. 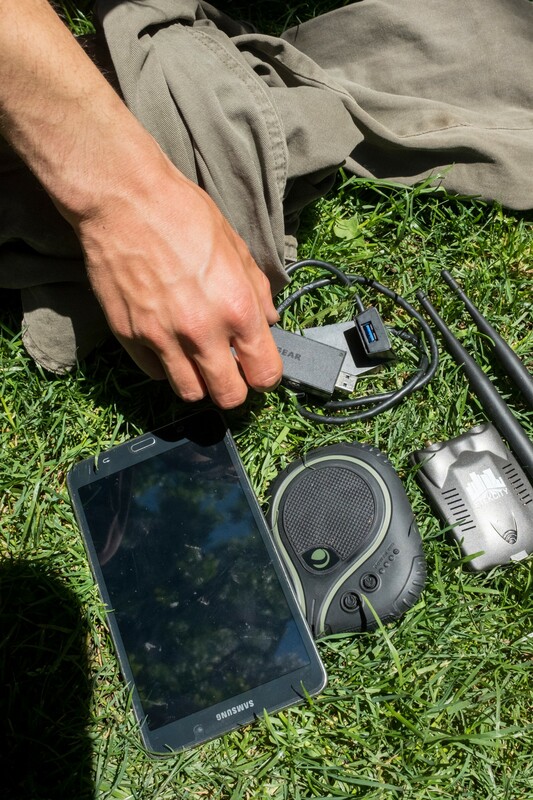 Many homeless youth have phones, tablets, and other tech to stay in touch. 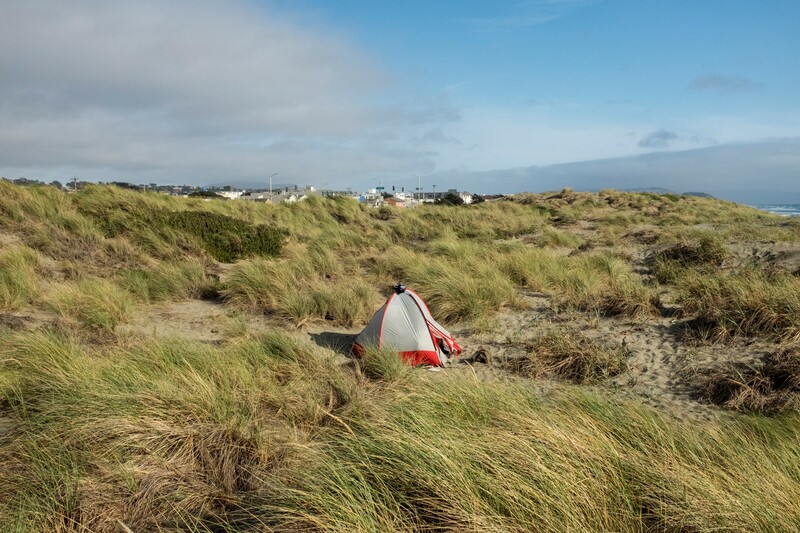 The park rangers will cruise the bluffs overlooking Ocean Beach to evict overnight campers. 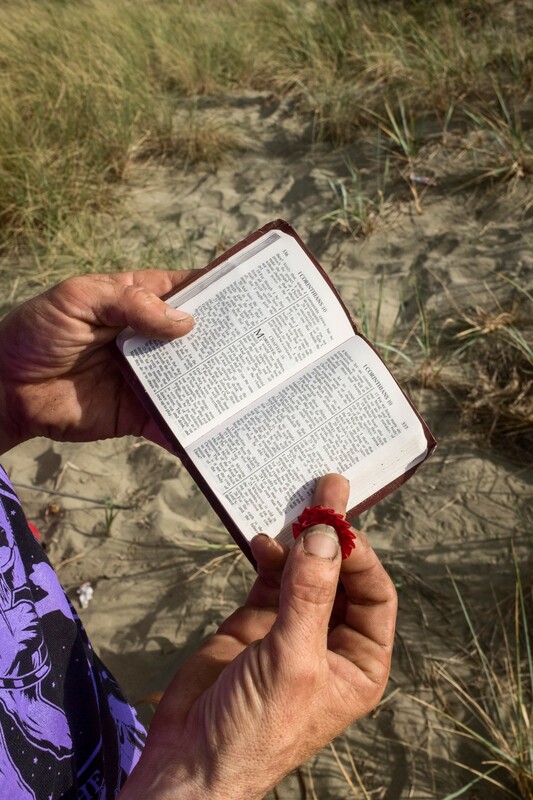 Jeremiah carries his Bible, in which he keeps a silk orchid. Stony, 20, lives in a car with her boyfriend and their three dogs. Shay with his dog, Sour Cream. 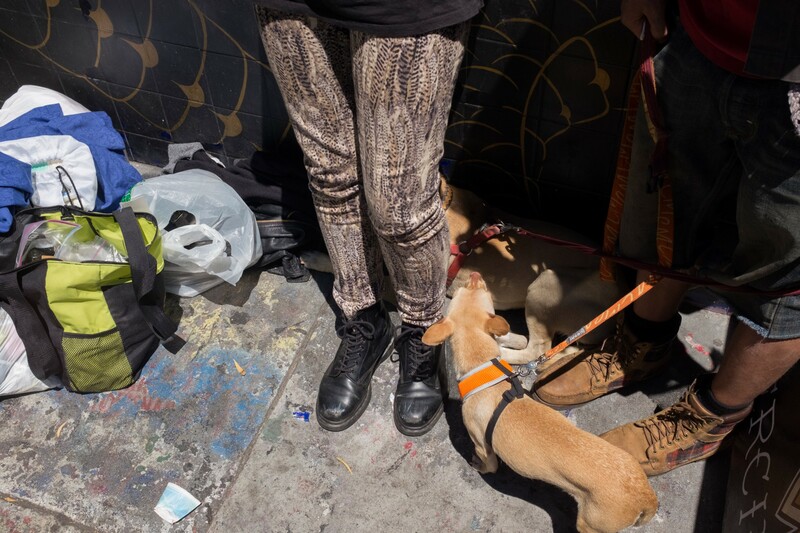 Many homeless youth say their dogs are their dearest companions. 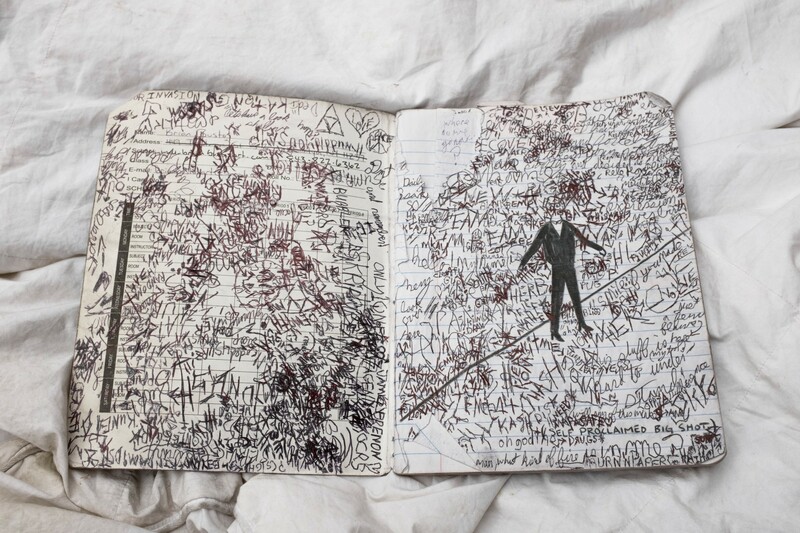 Rian Dundon is a photographer based in Oakland. His most recent book, FAN, is a visual memoir of China’s celebrity-industrial complex. He teaches documentary photography at the San Francisco Art Institute. Lauren Smiley is a San Francisco journalist covering how the tech boom has changed the city. Amy Standen is a podcast producer and radio reporter based in San Francisco. Stories and photographs from California, the West, Asia, and Latin America. Stories from California, the West, Asia, and Latin America.